The law firm of McGrath and Kane was founded in 1977 by Robert F. McGrath (dec.) and Paul M. Kane. 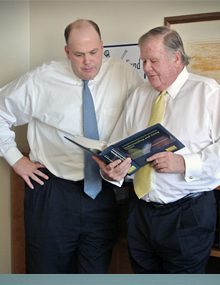 For over 40 years, McGrath and Kane, recognized as a leading domestic relations law firm and valued by the judiciary and its peers as a pre-eminent leader, handles high conflict family law matters involving business valuation, child custody disputes, child relocation issues, premarital agreements, complicated financial litigation and appellate matters. Paul M. Kane and Robert F. McGrath, both graduates of Boston College and Boston College Law School brought to their domestic relations practice experience and cutting edge legal skills based on education, preparation and integrity. Based on their desire to improve the domestic relations practice, they together with Associate Justice Edward M. Ginsburg, Ret. and Associate Justice James M. Sweeney (dec.) began the Massachusetts Continuing Legal Education Family Law Trial Skills Seminar. Today the law firm of McGrath and Kane is devoted to assisting clients through very difficult emotional situations and providing legal support at the time of life changing events. Centered in a team approach, clients are provided with knowledgeable and realistic legal support. At each phase of representation, a client is provided with an analytical expectation of the litigation process. While devoted to zealously representing a client’s interest, such representation is at all times within the bounds of professional principles and based in discretion. The law firm of McGrath and Kane is lead by Paul M. Kane, a former assistant dean of Boston College Law School and faculty member for 40 years, who by example provides intellectual skill in guiding the firm which consists of himself, Joan E. Kolligian, Martin F. Kane, II; Karen Sweeney Shea and Jennifer M. Walsh. The firm office is located in Boston, Massachusetts close to Massachusetts General Hospital and North Station. McGrath and Kane practices in all 14 counties in the Probate and Family Court for the Commonwealth of Massachusetts, the Appeals Court and Supreme Judicial Court of the Commonwealth of Massachusetts, and before the Federal District Court and District Court of Appeals in Massachusetts.